- Page 22 - Vista Casas Real Estate S.L. 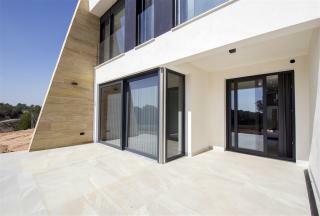 New Build 3 bedrooms, 2 bathrooms detached villas of 115m2 plus private roof solarium of up to 104m2 located in Pau 26, close to the Villamartin Golf and Plaza. Included in the price is private pool, tiled and artificial grassed garden, driveway parking, pre-installed air-conditioning/heating ducts. 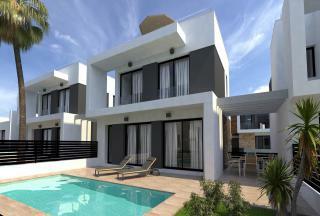 These properties will offer elevated views of the local area including the Salt lakes in Torrevieja. Reduced by 10.000 euro from 325.000 euro. 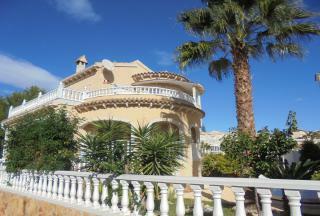 This 3 bedrooms, 2 bathrooms villa is situated on a 1200m2 plot. Offering elevated stunning views along the coastline. The property has massive potential to extend and develop. Located just a short walk from local amenities and a short drive to local beaches this villa is not to be missed. 23 Luxury Style Villas situated in an elevated position in San Miguel De Salinas, offering stunning views of the surrounding countryside as well as salt lake and sea views. All properties include 3 bedrooms and 3 bathrooms with different models to choose from. Basements are optional dependent on plots and models available. Contact us today for more information on this exciting new development. 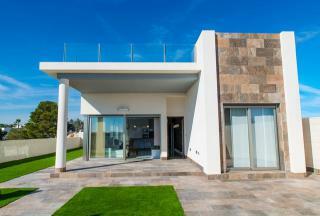 New Build 3 bedrooms, 2 bathrooms detached villas of 115m2 plus private roof solarium of upto 104m2 located in Los Dolses, close to the Villamartin Golf and Plaza and La Zenia Boulevard. Included in the price is private pool, tiled and artificial grassed garden, driveway parking, pre-installed air-conditioning/heating ducts. Lovely Large Villa with beautiful gardens and Pool Area. 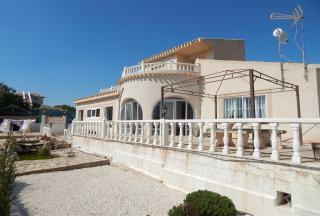 The property consists of 3 large bedrooms over 3 levels. The Main living is on the ground floor with Kitchen and lounge area. There is an external stair case to the upper floor with bedroom and ensuite. Off this is a large balcony/solarium. Fantastic traditional style detached villa situated in a quiet residential street, close to amenities.Comprises sunny garden areas and good size private pool, spacious terraces around the property with plenty of outside living space and a large private solarium with good views. 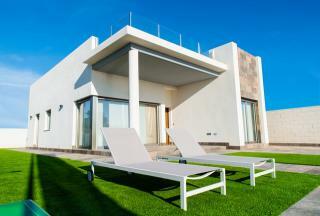 This beautiful extended Villa in Los Dolses has 3 bedrooms and 2 bathrooms. It is perfectly placed on a 440 sqm corner plot with gardens, driveway and private pool. This substantial villa, situated on a quiet residential street in this sought after neighbourhood on the Orihuela Costa, must be viewed. Electric entrance gates mean you can drive straight on to your plot and park. The house is set back giving plenty of space for the pool and garden. This Brisas model has been extended creating a very spacious third bedroom and is in excellent condition throughout. Newly released, Phase 2 of these beautifully designed and presented 3 bedrooms 3 bathrooms Townhouses located in the popular area of Los Dolses. The properties include the latest fixtures and fittings, front and back gardens, Pools or Jucuzzi (additional) with stunning distant sea views, while being within walking distance to an array of amenities. Situated in Lomas De Cabo Roig, a popular up and coming area this 3 bedrooms 2 bathrooms villa is not be be missed. Situated on plots starting from 201m2 with living area of 193m2 and additional 10m2 of bbq area including a 7x3m2 private pool these high quality properties are not to be missed. Already selling fast please contact us today to see our special offers. 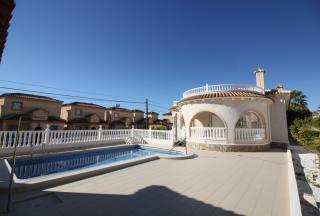 Just refurbished spacious detached villa with 3 bedrooms, 2 bathrooms located in Blue Hill on Orihuela Costa. The villa which is in one level has a spacious lounge with large kitchen and dining area. There are 2 bedrooms with built-in wardrobes, 1 more bedroom, 2 complete family bathrooms, storage, plot with private swimming pool, garage and a roof terrace. The property is finished to a very high quality.